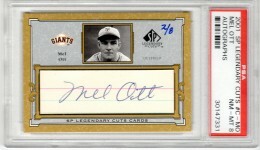 Mel Ott baseball cards and autographed memorabilia command prices equal to those of other great players from his era. He played his entire 22-year career with the New York Giants (1926-1947). 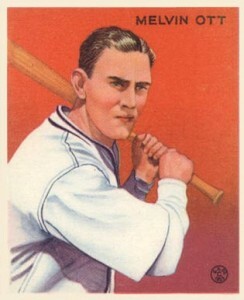 A twelve-time All-Star and World Series Champion (1933), Ott amassed career statistics that are lofty by any standard. Upon retiring he had achieved a lifetime batting average of .304 while hitting 511 home runs and 1,860 runs batted in. 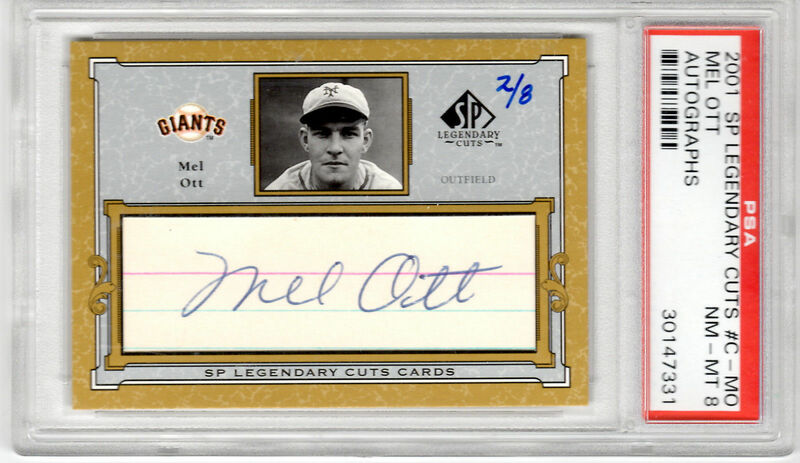 Mel Ott's first certified autographed cards were cut signatures in 1999 SP Legendary Cuts and 1999 Upper Deck Century Legends. That same year, Upper Deck would also release the first Mel Ott memorabilia card within the popular Piece of History 500 Home Run Club set. Designated as R319 in the American Card Catalog, this is one of two cards Ott has in the 1933 Goudey set. This one features an extreme close up head shot. The only other design components on the card front are his name and small company logo. 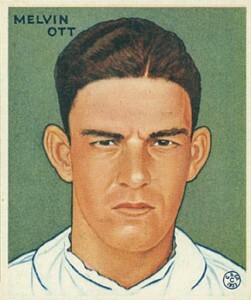 Featuring Ott in a batting stance against an orange background, no team affiliation is visible on this card either. Both of his Goudey cards command similar dollars on the secondary market. 1944 Mel Ott Polo Ground Wire Photo Denver Gonzaga 1st All-American Team! When looking to purchase authentic autographed memorabilia from legendary and long deceased players like Mel Ott, great caution is urged. We recommend buying authenticated Mel Ott signature autographs from one of the reputable authenticators in the industry, PSA or JSA. The most common items found to be authentically signed by Mel Ott include index cards, letters and newspaper clippings. Any cut signature trading cards from manufactures like Topps, Leaf, Tristar and Upper Deck should also be considered legitimate. The letter "M" starts with a slight angled line down and to the right before starting the vertical which is looped back up and into the first hump which is wider than the second. The "e" and "l" are similar with their height being the only difference. The "O" is written in a way so the pen stays on the item making it look like an "l" overlaps the "O." The "t"s are similar in that they both usually display some sort of crossed "l" look with a narrow loop. RARE FULL NAME Mel Ott Signed NY Giants HOF PSA Quick Opinion MINT 10?? 1961 GOLDEN PRESS MEL OTT #1 PSA 9 MINT! LASER SHARP! HOF'ER! ULTRA RARE!